The Brit upset the odds to score the biggest victory since his comeback to the sport. 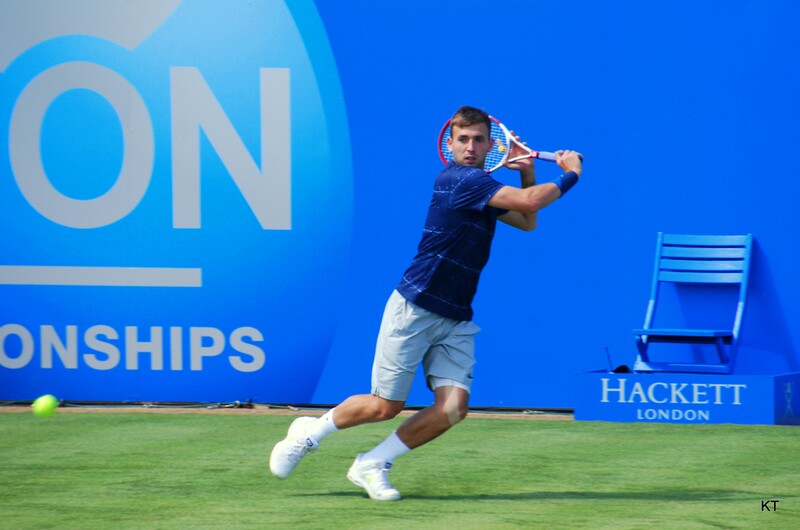 Dan Evans scored a momentous point for Great Britain from two sets to one down as he shocked Uzbekistan number one Denis Istomin, 7-6(4), 4-6, 0-6, 6-4, 7-5, in the opening singles rubber of the Davis Cup World Group play-off. The 28-year-old needed six match points to close out victory – four hours and 11 minutes after first ball toss – and it puts Leon Smith’s side in a commanding position ahead of the rest of the weekend. “I’ve worked pretty hard to get back to the level I’m at at the minute, but it’s only a step going forward,” Evans said post-match. The match began as Evans would have hoped, as the Birmingham native shook off some early jitters to settle into an effective service rhythm. He squandered three break points but he had the Uzbek at arm’s length as they raced towards a tie-break. That was when Evans came alive, rolling with the momentum off a crisp backhand shovel down the line and after 61 minutes he had secured the first set of the weekend for Great Britain. An early break in set two could have opened the proverbial floodgates but Istomin, playing with considerable confidence given his form, wrestled his way back into the match, fending off two break points from Evans in the eighth game before breaking the serve of the Brit to level the match. If Evans was left scratching his head at the manner in which he had surrendered the second set – “I probably let the second set linger too long,” he noted - then there could few doubts about the way in which he was annihilated in the third set. A bagel set from the Uzbek was dished out and for the first time since the US Open in 2016 Evans would be forced to go the distance in a match. A physical deterioration was expected from Evans given his lack of five set experience in the last few years but he stood tall, saving break point in the seventh game with a cute volley at the net. That served to spur him on as he raced out into a 0-30 lead as Istomin served to stay in the set and, after an untimely double fault from the Uzbek, he sent the match into a decider off an unforced error. Istomin’s five-set experience is vast, but even he was feeling the effects of a lengthy encounter heading into a deciding set. “First two sets I was okay, but then my energy burned down,” he said in his post-match press conference. That was evident in a fifth set that featured five breaks of serve. Istomin halted a run of four successive breaks in the eighth game while the crowd roared Evans on, drop shotting and mixing up the pace of his shots to unease the Uzbek. He held for 6-5 and the Brit could smell the finish line when he fashioned three match points. 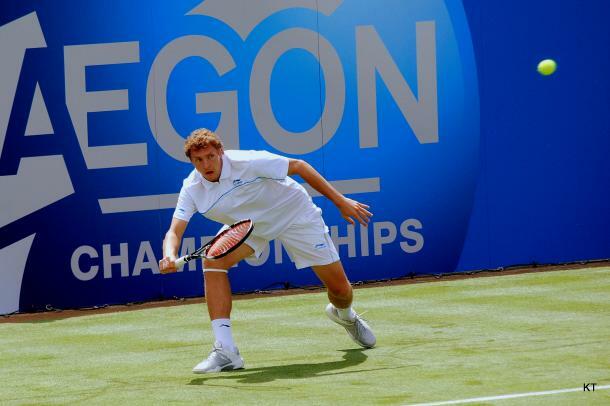 But Istomin rallied, salvaging all three, although his resistance was short-lived. The world number 60 saved match points four and five and was under the impression he had wiped the sixth match point from the scoreboard but, out of challenges, he could not contest a first serve line call. His second serve, meanwhile, was blasted past him for a winner as Great Britain drew first blood in Glasgow.